JACK NICKLAUS GUSHED ABOUT JORDAN SPIETH after Spieth captured his first U.S. Open and second straight major at Chambers Bay on Sunday. With 18 professional major victories, Nicklaus set the standard for greatness, but he also sees it in young Spieth, whose record is better than Jack's at the same stage of their respective careers. 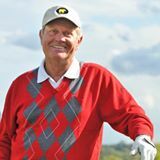 "It was interesting to follow the U.S. Open from afar," Nicklaus commented on his Facebook page, "whether it was on the U.S. feed in China or streaming video on the phone or just checking scores occasionally -- because it made you try to anticipate which golfer would hold up under U.S. Open pressure. "Going into Sunday's final round, there was a certain level of confidence in Jordan. He showed again that he is battle-tested and mature beyond his 21 years. He now has two major championship victories, six wins, and 27 top-10 finishes, and he is still younger than I was when I won my first tournament at 22." Nicklaus added, "I have always said that winning breeds winning, and that holds true even at the age of 21. This victory further validates that Jordan is not only one of today's great young players, he has become one of golf's greats -- period. Wow."